Q: Why do so many corporations incorporate in Delaware? A: There are several reasons. Delaware General Corporation Law is one of the most advanced and flexible corporation statutes in the nation. The courts in Delaware (particularly, the Court of Chancery) have over 200 years of legal precedent as makers of corporation law. State legislature takes its role seriously in keeping the corporation statute and business laws current. The office of the Secretary of State operates much like a business rather than a government bureaucracy. Q: If I incorporate in Delaware, can I do business in another U.S. state? A: Yes. Almost all of our clients incorporate in Delaware and operate in another state. Q: Is it necessary to use an attorney to form my corporation? A: No. When using a professional incorporating service company like Corporations Plus, it is not necessary to employ the services of an attorney to form a corporation. However, CorporationsPlus is always willing to work with your attorney if that is what you prefer. Q: What income taxes do I have to pay to the State of Delaware? A: None for out of state shareholders. Delaware collects an annual Franchise Tax based on the number of shares of stock authorized. Minimum tax is $225 for the annual Franchise Tax and Report ($300 for an LLC). Q: Do I have to live in Delaware? A: No, but Delaware law requires every corporation to have and maintain, in the State, a registered agent. Q: What is the difference between 'par' and `no par' stock and how much stock do I need? A: Par value stock has a stated value on its face. No par value stock has no stated value and its worth depends on what an investor is willing to pay. We suggest 1000 shares of no par value stock thus keeping the incorporating fee and annual franchise tax to a minimum. Q: Does my business have to maintain a bank account or any physical presence in Delaware? A: No. Your business does not need to maintain a bank account or any offices in Delaware as long as you are represented by a professional registered agent like CorporationsPlus. Currently, nearly a quarter million companies are registered in Delaware and few have ever even visited the State. Q: What is a registered agent and why do I need one? Q: I am not happy with my current Registered Agent, may I change agents? A: We certainly aren't here to take business away from our competitors, there is plenty of business to go around. But, YES, you may change agents. Learn more. 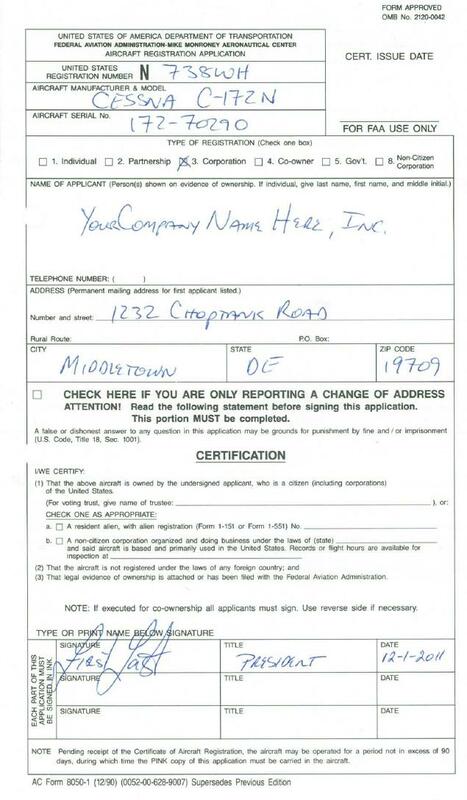 Q: Is "1232 Choptank Road, Middletown DE 19709" my legal mailing address in Delaware? Q: If I form a Delaware corporation can I do business in other states? A: Yes. Your Delaware corporation is what is known as a "domestic" corporation in Delaware. In other states it is considered a "foreign" corporation. Depending on the nature of the business, you may have to register your Delaware corporation in the state(s) in which you plan to maintain offices, hire employees, and transact business. Because of Delaware's many corporate advantages and low annual franchise tax, many businesses prefer to operate as a Delaware corporation in their home state. Q: How many directors and officers do I have to have for a Delaware Corporation? A: Only one officer or director. Q: How do I fill out the FAA Application for Registration? A: You use your company name (not your personal name) and use your Delaware mailing address. Be sure to include a title next to the signature and don't forget to print your name under your signature. Click to have a quick look at this example. Please Contact Us if there are any questions that we haven't answered. Would you like to Incorporate Now?